By Don Mitchell. Hb. 224 pp., 2013. 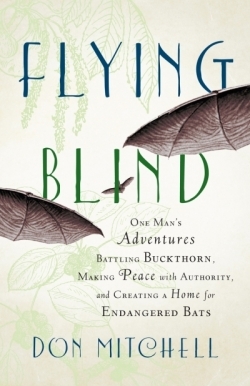 One Man's Adventures Battling Buckthorn, Making Peace with Authority, and Creating a Home for Endangered Bats. When a biologist with the Vermont Fish and Wildlife Department approaches Middlebury writing professor and shepherd Don Mitchell about tracking endangered Indiana bats on his 150-acre farm in Vermont's picturesque Champlain Valley, Mitchell's relationship with bats--and with government--can be characterized as distrustful, at best. But the flying rats, as Mitchell initially thinks of them, launch him on a series of "improvements" to his land that will provide a more welcoming habitat for the bats--and a modest tax break for himself and his family. Whether persuading his neighbors to join him in pulling invasive garlic mustard out of the ground by hand (marketed to them as an opportunity for "silent meditation"), navigating the tacit ground rules of buying an ATV off Craigslist, or leaving just enough honeysuckle to give government inspectors "something to find," Mitchell's tale is as profound as it is funny--a journey that changes Mitchell's relationship with bats, the land, and, ultimately, his understanding of his own past. The interwoven narratives of contemplations on nature and life in Flying Blind are in the vein of Terry Tempest Williams's Refuge and Annie Dillard's Pilgrim at Tinker Creek. "Befriending bats had been a means to figure out, against all odds, where in the world I actually was. And exactly who I was," Mitchell writes. "And to participate--thankfully, joyfully--in the wild party that keeps going on around us." Ruminating on the nature of authority, the purview of the state, and the value of inhabiting one's niche, Mitchell reveals much about our inner and outer landscape in this perfectly paced and skilled story of place.